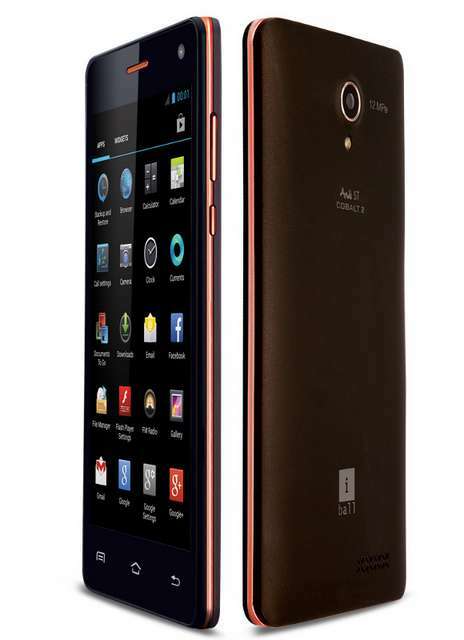 iBall Andi5T Cobalt2, the latest smartphone from the company has been officially launched. The iBall Andi 5T Cobalt2 has 5 inch 1280 x 720 pixels HD OGS Display and quad core CPU. It is upgraded version of iBall Andi 4.7G Cobalt that was launched in 2013. The Andi 5T Cobalt 2 draws the power from 1.3GHz 4-core CPU based on Cortex A7 Architecture. It would compete with Zen Ultrafone 701 HD and recently launched Micromax A177 Canvas Juice. The handset looks impressive from all aspects at this price tag. It is just 8.9 mm thick that makes it more fancy, stylish and easy to hold. The iBall Andi 5T Cobalt 2 runs on Android 4.2 Jelly bean and it can be upgradeable to Android 4.4 Kitkat. Talking about the camera, it has 12-megapixel primary shooter with flash and a 2-megapixel front imager for video calling. It supports DUAL SIM and offers up to 42Mbps of downloading speed (actual speed depends on network operator). The Andi5T cobalt2 weighs 144grams and measures about 146 x 73.5 x 8.9 mm thick. It supports Full HD video recording and playback. It comes with 1Gigs of RAM and 4Gigs of internal storage. The expandable storage is up to 32GB vi micro SD card. It offers 3G, Bluetooth, GPS, WiFi b/g/n, FM radio and micro USB port. To make the phone alive there is 1750 mAh battery, which might not be enough in many cases. Apart from the hardware the iBall Andi 5T Cobalt features FLIP TO MUTE, auto call recording, voice control for phone and shake to answer. Iball Andi5T Cobalt2 is priced at RS 12,499 and it comes in Red , white and Blue Colors. It comes with three removable covers in the same colors.